You would think that after last year’s movie Borat it would be impossible for British comedian Sacha Baron Cohen to dupe another live audience. You would be wrong. Fight fans were so incensed by Cohen’s latest stunt that they threatened the comedian and pelted the ring with beer. This video is from yardbarker.com and is allegedly from a couple of weeks ago. The UFC has just reached its biggest mainstream marketing breakthrough yet. UFC action figures and other toys will soon be hitting the shelves at Wal-Mart. UFC’s has reached an agreement with toy manufacturer JAKKS that will put UFC action figures and other mrchandise in major retailers such as Wal-Mart, Target and Toys”R”Us. The deal comes one week after the “major” announcement by UFC of Lorenzo Fertitta being named the CEO of UFC. MMA Junkie speculates this deal and one recently signed with JC Penney are the types of mainstream marketing agreementments you will see more of from UFC now that Fertitta, a bigtime casine executive, has joined the company’s fulltime. UFC action figures are expected to hit the shelves at Wal-Mart, Target and Toys “R” Us for Christmas of 2009. Speculation is the first UFC figures available will be Brock Lesnar and a “classic” Tank Abbott since JAKKS can simply repackage the pair’s already existing WWE toys. Action figures generated $1.5 billion dollars in sales last year. Here’s the scariest stat you’ll see today: fully one third of those sales aren’t purchased as toys but as “collectibles” for males 15 or older. Randy Couture is one of the greatest fighters in mixed martial arts history. Apparently those skills don’t run in the family. Last night his wife, Kim Couture, was destroyed in her MMA professional debut in Las Vegas. MMAjunkie.com has the bloody pictures of Kim Couture who may have suffered a broken jaw during the fight. 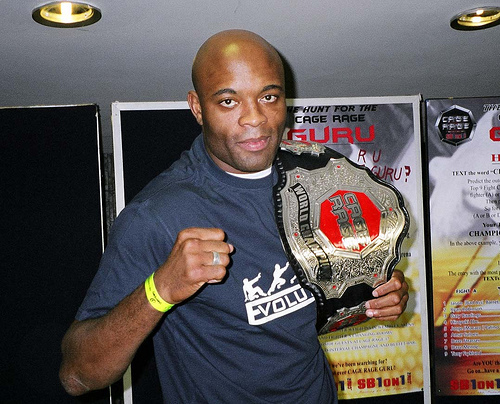 Frank Trigg recently posed with his ICON title belt. UFC fighter Chuck Liddell is getting married. According to Page Six of The New York Post, Liddell proposed to his girlfriend, Erin Wilson, last week while the two were vacationing in Europe. 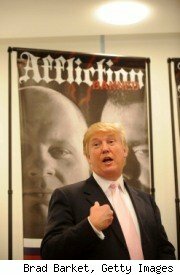 AOL Fanhouse reports Billionaire Donald Trump held a press conference yesterday to announce his purchase of a stake in Affliction, a rival MMA organization with plans to compete against UFC. 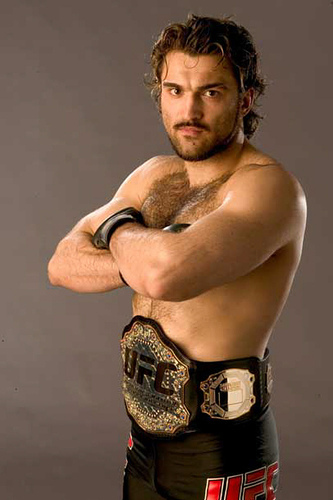 Trump also used the press conference to announce the signing of former UFC heavyweight champion Andrei Arlovski. Arlovski is scheduled to fight on a July 19th pay-per-view card along with Fedor who is fighting another former UFC champ, Tim Sylvia. 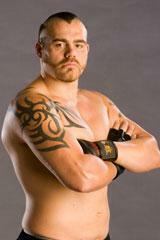 Other former UFC fighters in the Affliction stable include Josh Harnett, Noguiera and Babalu. Trump says he also wants to sign popular light heavyweight Tito Ortiz. 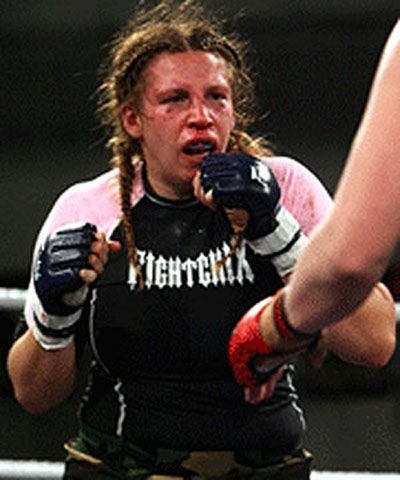 Amanda Lucas (daughter of Hollywood/Star Wars icon George Lucas) fought in an MMA event this weekend in New Zealand. 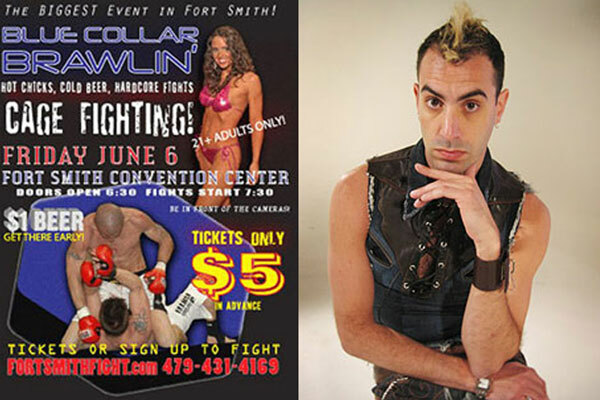 The bout was taped for a reality tv show about the formation of a women’s international fight league. According to a magazine article, Lucas, who has appeared in three of her father’s Star Wars blockbusters, slipped unnoticed into New Zealand last Sunday with a US all-female fight team. This month’s edition of Rolling Stone magazine has a feature on Ultimate Fighting Championship president Dana White. Although White admits in the article “I swear a lot” and “I’m a classless moron” the article is very favorable towards him. The way things are going, Dana White, president of the Ultimate Fighting Championship, may soon be hailed as the greatest sports promoter ever, of all time, bigger even than boxing’s Don King, bigger even than pro wrestling’s Vince McMahon. In fact, the UFC itself is a literal sidebar to Rolling Stone. To them the story is Dana White. Even the online UFC story features a picture of White. And White does nothing to dissuade Rolling Stone from its premise that it’s him, not the fighters, that makes UFC. 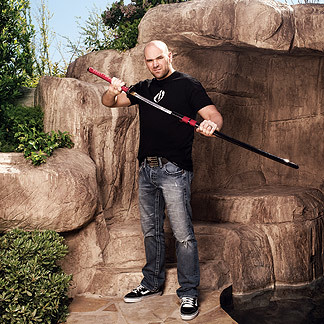 White and the UFC have recently had some very public battles with fighters Randy Couture and Tito Ortiz over money. See, this is the one part of the business I f-ing hate. Everybody wants more money, they want it now. And then all these fighters are like, ‘We’re the superstars, not the UFC! It should all be about us.’ You dumb motherf-s. You don’t know what you’re f-ing with. I’m a promoter. And a lot of this s- is built with smoke and mirrors. If there was ever any doubt, the Rolling Stone article makes one thing crystal clear-White works for UFC. Not the fighters.